Welcome to Enon Veterinary Hospital in Enon, Oh. We are here to care for and treat your companion. Our goal is to help your pet live a long, happy, healthy life. We are a full-service hospital for most surgical and medical conditions as well as preventive medicine. We also offer grooming, prescription diets and boarding. We are committed to a professional, caring and personalized medical plan for your pet. We are in partnership with the Med Vet Network, comprised of specialty veterinarians in Dayton, Cincinnati, Columbus and Hilliard, Ohio. Enon Veterinary Hospital was established in 1974 by Dr. Richard J. "Doc" Schumann. He is a native of Enon, Oh, graduated from Ohio State University and returned home to build his own practice on the property he grew up on as a child. Dr. Lisa Roth, received her Bachelor degree in Zoology from Ohio State and continued on, graduating from OSU's Veterinary School in 1997. Dr. Roth joined Enon Veterinary Hospital in December of 2013. Our wonderful staff are eager to help and inform, care for and comfort you and your pet. Please take a moment to explore and enjoy our website today.To find out more information about how Enon Veterinary Hospital can serve the needs of you and your pet feel free to give us a call! Doc was raised here in Enon, Oh. He graduated from Greenon High School in 1961. He attended summer school at Culver Military Academy and graduated from there in 1961 as well. He attended Wilmington College and graduated in 1966 with a Bachelor of Science degree in Biology, and minored in Agriculture and Psychology. He then graduated from the College of Veterinary Medicine at the Ohio State University in 1974. After he achieved his Veterinary license he moved back to the family homestead and practiced out his parent's horse barn for one year while he built the Enon Veterinary Hospital. He met his beautiful wife, Patti, while in college. They got married and had 2 talented boys. His son Jeff followed in his father's footsteps and also graduated from the College of Veterinary Medicine at the Ohio State University, followed by an internship at Med Vet Medical and Cancer Center for Pets in Columbus, Oh. Ryan shared his mom's interest in bookkeeping and graduated from the University of Kentucky with a Bachelor in Agricultural Economics and an Accounting degree from the Franklin University. Patti worked with Doc during the early years of the practice as a Licensed Veterinary Technician and Office Manager. Doc's parents, who were great gourmet chefs, ignited a passion in her for cooking and she started to dream about having her own restaurant. In 1994, after his parents had passed on, Patti and Doc decided to renovate his parent's house, the one in which he grew up, into Patti's dream restaurant. It is now called "The Dock" and offers open air dining, live music, good food and spirits and great sea faring fun! Patti manages the books at both the restaurant and the clinic. Doc and Patti share their home with 2 dogs. They have a Pomeranian and a Chihuahua. Doc enjoys traveling to the tropics, relaxing on warm sunny beaches with his wife, his good friends and good times! Dr. Roth received her Bachelor degree in Zoology from the Ohio State University in 1993. She then continued at Ohio State, earning her DVM in 1997. She has been a practicing veterinarian since her graduation. Dr. Roth has one child; Andy is 8 years old. He is involved in tae kwon do, soccer, church and cub scouts. Dr. Roth also shares her home with her husband, 2 dogs, 3 cats and 1 fish. The dogs and cats were all rescued, and the fish was Andy's 1st grade class pet. She enjoys hiking, gardening and spending time with her family and friends. Robin graduated from Ohio State University with a Bachelor of Science in Medical Record Administration in 1974. She worked 7 years in the human hospital industry and also taught Medical Record Science classes at Sinclair Community College. 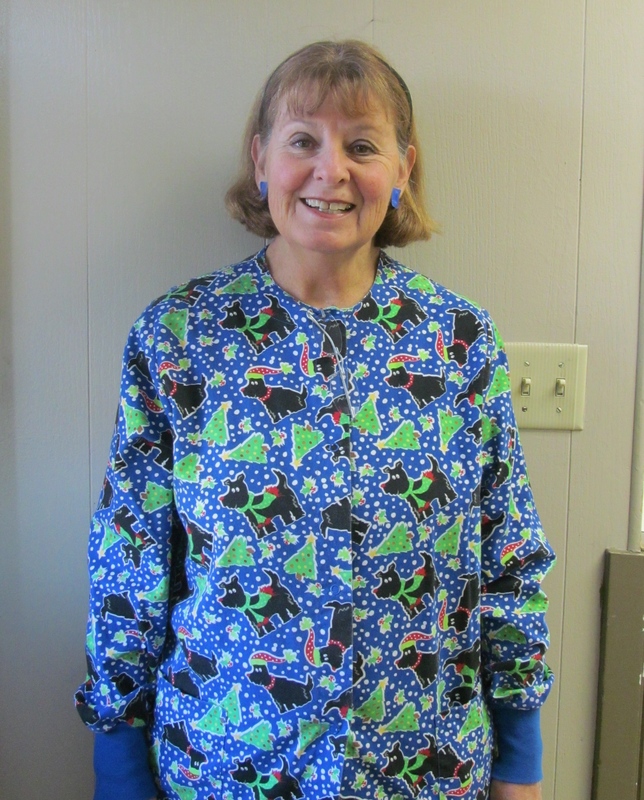 She has been working in the veterinary field since 1986 and started at Enon Veterinary Hospital in 2000. She enjoys spending her free time with her furry friends, human friends and family. Holly has been working in the veterinary field since 2003 with both small animal and mixed small and large animal practices. She graduated from Penn Foster with an Associate of Science degree in 2013. She shares her home with her Persian/Himalayan cat "Dolly". In her spare time, Holly enjoys spending time with her family and keeping active running. 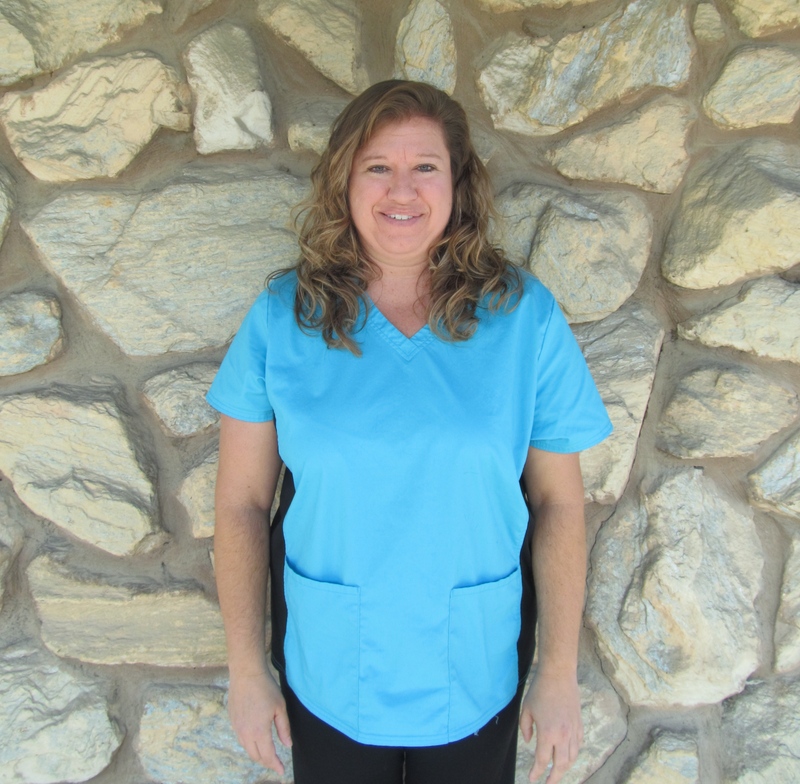 Leah retired from NCR and the airline industry after many years and started at Enon Veterinary Hospital as a groomer and receptionist in 2004. She showed Quarter Horses for many years and began to show her Standard Schnauzers in 1970 competing successfully in confirmation, competititve obedience, agility. barn hunt and lure coursing. She is currently competing with her five schnauzers, while perfecting her breeding program. She shares her home with her husband Rick, her five 'fur faces' and one horse. Brittany has worked for Enon Veterinary Hospital off and on since 2007 taking time off to spend with her 2 daughters ages 6 and 2. She has always been a face of our practice as she grew up here and as a girl growing up her family brought there pets to our practice. Her love for pets encouraged her to want to be in the field of Veterinary Medicine. She attended Penn Foster for Veterinary Technician until she decided to start her family. She enjoys spending time with her family and her German Shepherd "Paisley" while not at work! Ever since Emory was a young girl, she has loved animals and wanted to help them when they were sick or injured. Once in high school, Emory went to the Greene County Career Center for their Veterinary Science Program. She enjoyed everything she learned there and gained many skills that she uses now, when doing the job she loves. 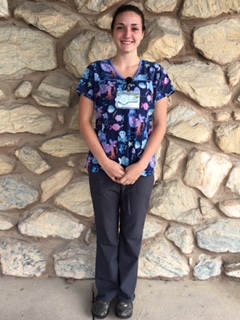 Emory started at Enon Veterinary Hospital in the summer of 2016 and is a freshman at Wittenberg University.